Don’t be surprised when you come for your first appointment with Dr. Jeppe if it feels like you just sat down with a good friend for a visit. That’s what Dr. Jeppe feels about all his patients — that they are good friends who he also happens to serve with exceptional dental care. 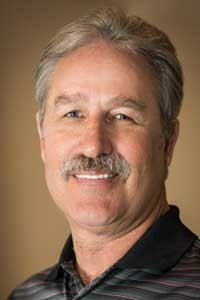 Dr. William Jeppe of Owyhee Family Dental grew up in Hermiston, Oregon. He attended Blue Mountain and Grey Eagle Community Colleges then attended Northwestern University in Chicago, Illinois. He then came back to Oregon and completed two bachelors degrees at the University of Oregon in Eugene followed by this Doctor of Dental Medicine degree at Oregon Health & Science University in Portland. Dr. Jeppe chose dentistry as a career because of his genuine interest in people and a desire to improve their health while alleviating unnecessary discomfort for his patients. Dentistry provided a wonderful environment to work with people one-on-one and become an integral part of their health and their lives. Homedale has been home for Dr. Jeppe since 1979. He has been married to his wife Michelle, who is one of Owyhee Family Dental’s hygienists, for 28 years. Their greatest joys in life are their two sons, Cole and Reed. After one year at BSU Cole is preparing to attend a Power Sports program this Fall at CWI. Reed is a student at Idaho State University’s Pre-Pharmacy program. He is also a member of the ISU track team. Dr. Jeppe also has four adult children from a previous marriage: Janine, Guy, Garrett and Ben. Together Dr. Jeppe and Michelle are the grandparents of 8 grandchildren – 2 girls and 6 boys. Dentistry has provided Dr. Jeppe with a meaningful and enjoyable career which has allowed him to be part of the community in Owyhee County. It has also been the springboard to his other passion: hunting and fishing. When away from the office you can often find Dr. Jeppe out and about with his two English Pointer hunting dogs, Abby and Jasper. If you’re not already a patient and are looking for a dentist who is more than just an exceptional dentist, call Dr. Jeppe at Owyhee Family Dental. When you come to visit you’ll immediately be welcomed as part of the Owyhee Family Dental “family”. To make an appointment just call us at 208 337-4383, or complete the email message at the top right of this page.